We received the mentioned product in exchange for an honest review. The thoughts contained within this review are ours and may vary from the thoughts of others. Since becoming a mother to my 2 boys I have always treasured pieces of jewelry that remind me of them and their births. Jack our oldest was born in 2013 and Willie followed in 2017. Born in June & March they each have a unique birthstone that I love to see on jewelry and other keepsakes. This Valentine’s Day I am so happy to feature MothersFamilyRings.com here on the blog and our social media as well as share the story of their amazing business. Our family has been in the jewelry business for over 40 years. We have passion for everything we do. One reason we got into the mother’s jewelry line in because we know how important family is. The owners of Moriarty’s Gem Art and this website have been together for almost 40 years and have 3 wonderful children, two of whom are now in the jewelry business as well. We want to create a wonderful piece of jewelry that will be cherished by your family for generations to come. We set out to create amazing designs for mothers. We had so many family’s coming into our store asking for something that would represent them as a family, and the options available were very limited. Most items were cheaply made and not made to last. That is why we decided to start creating them from scratch. Our designs are hand crafted in gold and platinum, and set with some of the most amazing stones, which are all handpicked by us, you for you. We want our jewelry to be in your family for generations, and the only was to do that was for us to create them ourselves. 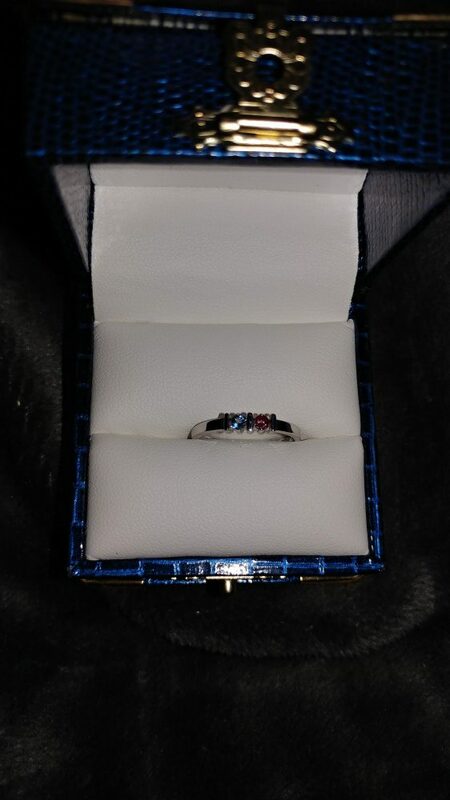 This ring arrived by USPS and I did have to sign for it which gives me confidence with buying from this amazing company. I feel that knowing I will get the product in a timely manner and know that I will receive it right to my door is just amazing. 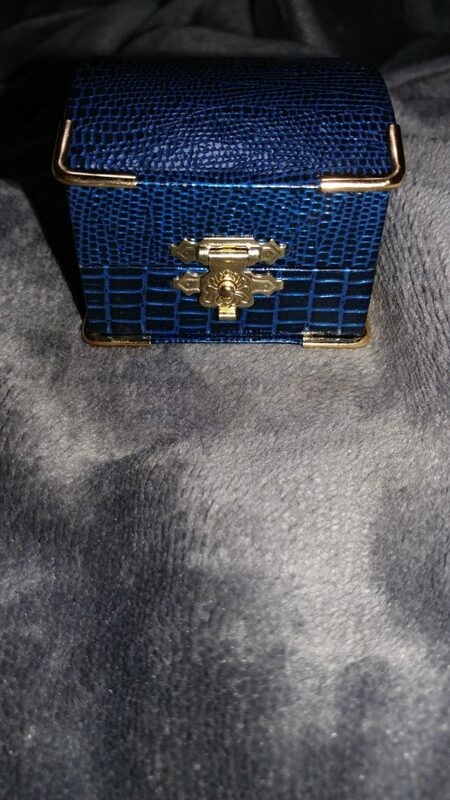 I felt like I was opening a treasure chest with this beautiful navy blue box. The accent metal and the closure make this just absolutely perfect! My camera did it no justice as this box is stunning by itself. I knew that I was in for a huge surprise for what was inside. Upon opening the box I found this beautiful treasure. This ring sums up my life as a mom. I like to keep things simple. This sterling silver ring does just that but it is a conversation piece because while dainty and great for my smaller hands this ring tells a story. It includes both of my boys (the first piece I have gotten with them together) and I know that it was made with love. This company has an amazing site where you can customize this ring and so many others. I also love that inside the package was information on the birth stones which I found both great to have and really educational. It included information that I was previously unaware of. 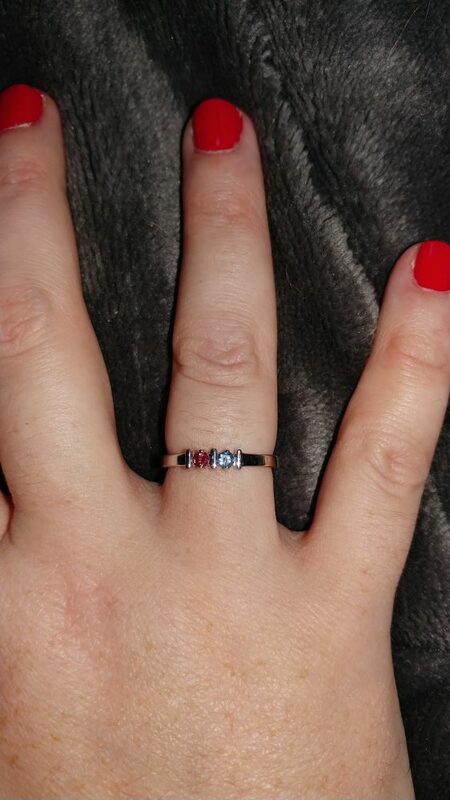 Here is the amazing ring on my hand where I can be reminded that my boys are amazing and unique, just like their birth stones. This ring is one of my newest possessions but one of my most prized. I will treasure this for my entire life and know that Valentine’s Day 2019 and so many others to come are not only just for people who are fond of one another as far as husband and wife but also for moms all over the world and their babies. If you are looking for other Valentine’s Day gift ideas please check out our 2019 Valentine’s Gift Guide on the blog. We are in the process of adding so many amazing gift ideas.